"EB on VC in July." There wasn't much else to the message. We were skeptical at first -- EarthBound fans have endured more ill-fated rumors, delays, false starts, cancellations and disappointments than probably any other fanbase in gaming history, so we approach everything with a healthy skepticism. Like, 0% body fat skepticism. After a little investigation, though, we were assured the source of the message was totally legit. In addition to that, we had actually heard from other sources (namely, a post from Lucas Thomas of IGN on our forum) that EarthBound was slated for a summer '07 VC release. We knew what was happening -- it was something we had been anticipating since Iwata mentioned EarthBound during the Virtual Console introduction. This would be our last chance to prove to Nintendo that EarthBound could be a commercial success. So began one of the most hectic, sleepless, tiring, awesome summers in the site's history. The EarthBound Anthology, a 260+ page compendium of facts, statistics, commentary, and history regarding EarthBound and its unfortunate reception in North America, filled with more than 200 pages of fan-made artwork. With all of the press, our goal was to boost EB on VC's downloads through the roof. Beyond the media blitz, we had tons of stuff ready to release as soon as the game hit the VC. Fan-made marketing materials, more grassroots campaigns, mailing lists, contests, media contacts, the whole works. The final goal was the same as it's been since we started this website in 1998: get EarthBound's sequel (MOTHER 3) translated and released. If EarthBound's VC sales were strong, we knew we could make that happen -- we had been told as much by several different Nintendo employees. In the capable hands of Jon Kay, steps 1 and 2 went from vague ideas to finished projects in about a month's time. 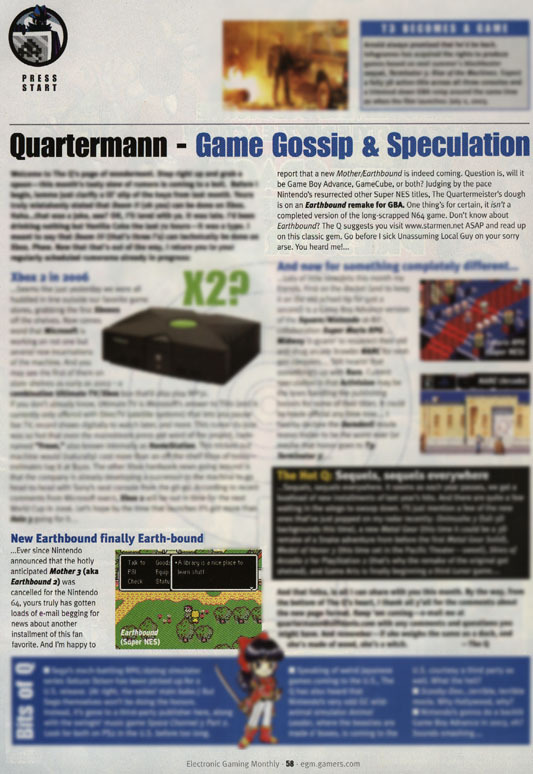 In the two weeks leading up to E3, Jon and I (as well as many other Starmen.Net staffers) crammed in hundreds of hours of work, and it was paying off: EarthBound's VC release was promising to be some of the biggest gaming news of the summer. Not only would anyone be able to legally play the game for less than $85 (the latest going rate on eBay), but we'd finally get our chance to prove to Nintendo -- with cold, hard cash -- that EarthBound was a profitable franchise worth reviving. True to form, though, we were a little over-optimistic. As a side note, one of the sources which was keeping us updated re: EB on VC helped us to predict all three of the major MOTHER-related Brawl announcements. We didn't publicly predict the Franklin Badge announcement because we were a little dubious, but everyone on staff was like 'wtf no way' when it came true, so we knew we had to go public with the other two predictions. Sure enough, the weeks following E3 were barren. By the end of July we heard from our contact -- all they could say was that there were delays, and while things weren't falling apart, it wasn't looking good. Maybe August? After an agonizing couple of weeks (and the release of the hotly-anticipated DK Math Jr), we got something solid: December. We adjusted our plans accordingly. We didn't realize it at the time, but the appearance of NoA's legal squad was the beginning of the end for EarthBound. They were demanding changes to the game, and while we can't say specifics, it's safe to assume they were uncomfortable with the game's constant pop culture references. EarthBound's soundtrack, in particular, references/samples/mimics every band under the sun, and hearing that a game is constantly referencing bands like The Beatles is enough to make any IP lawyer wring his hands. You might be thinking, "sampling/references aren't enough to bring a lawsuit", and you'd be right. But it's also true that not everything in EarthBound is simply sampled/referenced, and even if the game was technically legal, that doesn't mean lawyers will be comfortable with it. They get paid to avoid lawsuits entirely, not to get sued and then say "here's why this lawsuit is stupid". This wouldn't normally be an issue (lots of changes have been made to other VC releases), but there was one major problem: NCL wasn't playing ball. For reasons we can only guess, the head honchos back in Japan were refusing to let NoA modify the game prior to release. Was it too expensive? Did they disagree with the NoA lawyers' assessment? Were they just being stubborn? Was Itoi involved somehow? None of our sources were able to tell us what transpired. Meanwhile, we were in the dark, still expecting a December release. By January 2008, we were getting worried. December had come and gone, and Brawl's release was drawing near. 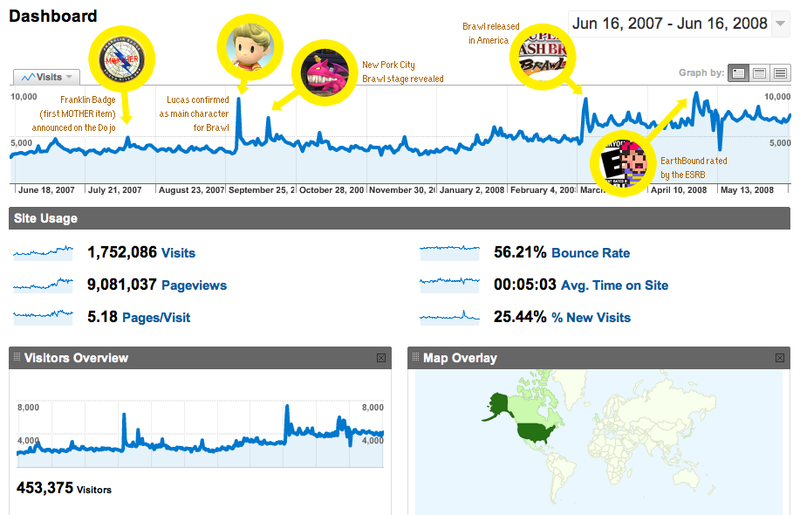 If Nintendo hoped to release EarthBound, their window of opportunity was closing -- SSBB's hype had been sending Starmen.Net's traffic off the charts, and it didn't take a marketing genius to realize that, a few weeks/months after the game was released, most people would stop caring about Ness. 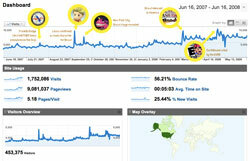 In March '08, Brawl was released and our traffic peaked. The game came with an unpleasant surprise: EarthBound's demo had been removed from the Masterpieces section, even though it was present in the Japanese version of the game. The following Mondays were agonizing, and when EB failed to materialize on the VC we contacted our source to find out what was going on. This is when we found out that NoA's lawyers were refusing to release the game without changes, and NCL was refusing to authorize those changes. The stalemate, if it continued, guaranteed that the game would go unreleased. That news is what compelled us to organize the PK Tube'N in the spring of 2008. It was a last-ditch effort to salvage the game, and we made that much clear: in the video, we explained that "EarthBound is probably not coming out on Virtual Console". The fans responded in the same way they always have: with a huge flood of creativity and an outpouring of support. The Tube'N was a great success, with the submitted videos garnering about 400,000 views over the course of a month. Part of the reason the Tube'N felt like such a huge success is because, only a week after it started, EarthBound was rated by the ESRB, capping off a huge Shacknews article about the community. This, of course, sent fans into a frenzy, and since then pretty much everyone has believed that it's just a matter of time before EB is released on the VC. The VC rating was a mistake. Not like "ugh we never should have done the ESRB rating early, all these annoying fans are all worked up", but more along the lines of "Uhhh, why was EarthBound rated? I thought the guys over in legal told us to forget about it?" From what we've learned, Nintendo never intended to send EarthBound up the flagpole; it seems to have been some kind of internal mistake on behalf of the ESRB. By the time both parties (NoA and the ESRB) realized what had happened, it was presumably not worth the effort to 'fix'. NoA didn't have to pay for it, and the ESRB didn't have to go to the trouble of backpedaling. And besides, as far as the ESRB knew, the game would be released eventually anyway... right? EB was, and will continue to be, withheld due to legal issues. It doesn't matter what anyone's opinions are on copyright law or fair use; the fact is that Nintendo's lawyers have a huge amount of leverage over the release of any game they're uncomfortable with, and EarthBound made them pretty uncomfortable. 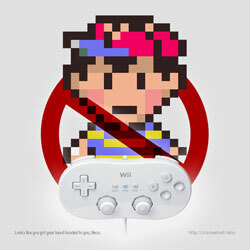 As long as NCL remains unwilling to approve changes to the game, EarthBound will stay buried. This is a little depressing for us all as EarthBound fans, probably moreso for the new people we've had flooding in over the past two years who aren't used to the constant disappointments ;) If you're among them, consider these unpleasant circumstances like your induction into our creepy masochistic society. Now that you've experienced the unflinching neglect of a multinational gaming company, you're one of us! No worries, though. As EarthBound fans, we'll continue to take matters into our own hands and ensure that this great game gets recognized. We're working on a new site, and we've got a lot of big plans for the future. If you'd like to help out, add EarthBound Central to your daily surfing routine and consider buying some of the EB-inspired swag we're selling at the Fangamer Store. The store sales keep us alive while we're working on the new site (and the new Starmen.Net Forum, which we launched last year)! If you want to vent your nerd rage or get some clarification, join the conversation on the forum. If you want to spread the word, Digg it.